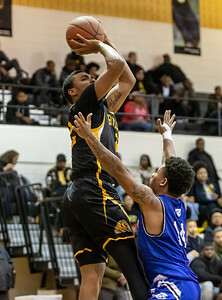 Bowie, MD, Saturday, February 16, 2019: Rinardo Perry (0) of Bowie State puts up a shot during a CIAA basketball game between Chowan University and Bowie State University held at A.C. Jordan Arena in Bowie, MD. Perry scored 16 points in the Bulldogs 68-66 win. (Michael R. Smith/The Prince George's Sentinel). 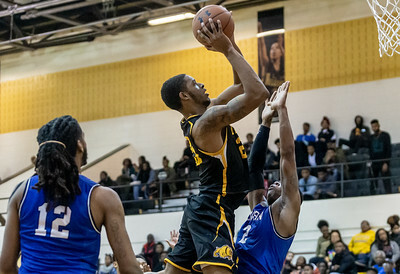 Bowie, MD, Saturday, February 16, 2019: Bowie State's Rinardo Perry (0) powers up a shot during a CIAA basketball game between Chowan University and Bowie State University held at A.C. Jordan Arena in Bowie, MD. (Michael R. Smith/The Prince George's Sentinel). 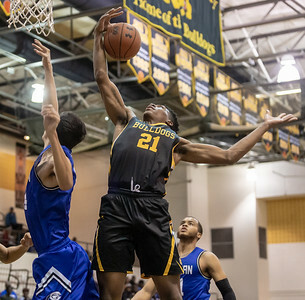 Bowie, MD, Saturday, February 16, 2019: Yohance Fleming (25) of Bowie State is fouled while going to the basket during a CIAA basketball game between Chowan University and Bowie State University held at A.C. Jordan Arena in Bowie, MD. (Michael R. Smith/The Prince George's Sentinel). 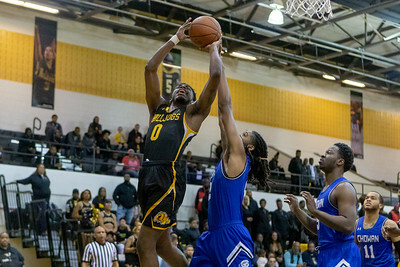 Bowie, MD, Saturday, February 16, 2019: Bowie State's Rinardo Perry (0) goes to the basket for two of his 16 points during a CIAA basketball game between Chowan University and Bowie State University held at A.C. Jordan Arena in Bowie, MD. (Michael R. Smith/The Prince George's Sentinel). 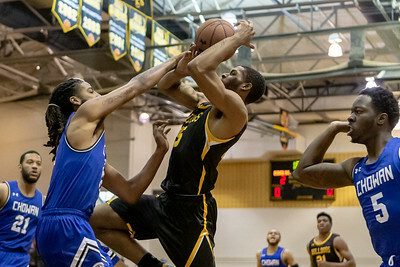 Bowie, MD, Saturday, February 16, 2019: Chowan's Gus Rowland (11) tries to block a shot by Bowie State's Rinardo Perry (0) during a CIAA basketball game between Chowan University and Bowie State University held at A.C. Jordan Arena in Bowie, MD. (Michael R. Smith/The Prince George's Sentinel). 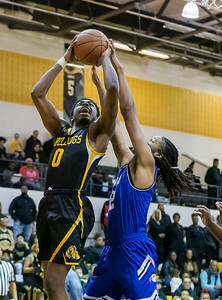 Bowie, MD, Saturday, February 16, 2019: Yohance Fleming of Bowie State shoots over Deon Joyner (12) of Chowan during a CIAA basketball game between Chowan University and Bowie State University held at A.C. Jordan Arena in Bowie, MD. (Michael R. Smith/The Prince George's Sentinel). 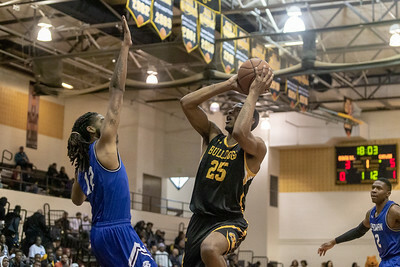 Bowie, MD, Saturday, February 16, 2019: Yohance Fleming (25) puts in two of his eight points during a CIAA basketball game between Chowan University and Bowie State University held at A.C. Jordan Arena in Bowie, MD. (Michael R. Smith/The Prince George's Sentinel). 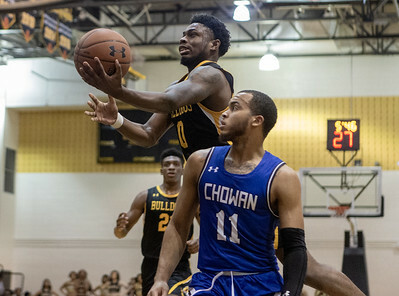 Bowie, MD, Saturday, February 16, 2019: Saiquan Jamison (21) scored eight points and grabbed 13 rebounds during a CIAA basketball game between Chowan University and Bowie State University held at A.C. Jordan Arena in Bowie, MD. (Michael R. Smith/The Prince George's Sentinel). 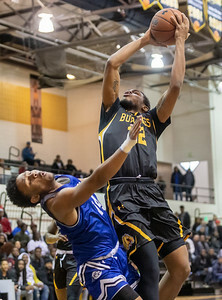 Bowie, MD, Saturday, February 16, 2019: Saiquan Jamison (21) is fouled while putting up a shot during a CIAA basketball game between Chowan University and Bowie State University held at A.C. Jordan Arena in Bowie, MD. (Michael R. Smith/The Prince George's Sentinel). 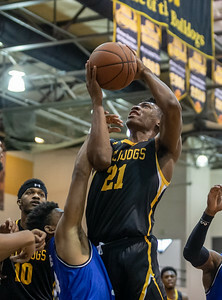 Bowie, MD, Saturday, February 16, 2019: Cameron Hayes (22) of Bowie State scored eight points during a CIAA basketball game against Chowan University at A.C. Jordan Arena in Bowie, MD. (Michael R. Smith/The Prince George's Sentinel). 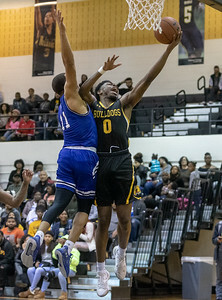 Bowie, MD, Saturday, February 16, 2019: Yohance Fleming (25) of Bowie State puts up a shot in the lane during a CIAA basketball game between Chowan University and Bowie State University held at A.C. Jordan Arena in Bowie, MD. (Michael R. Smith/The Prince George's Sentinel). 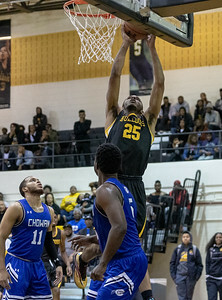 Bowie, MD, Saturday, February 16, 2019: Bowie State's Cameron Hayes (22) commits an offensive foul during a CIAA basketball game between Chowan University and Bowie State University held at A.C. Jordan Arena in Bowie, MD. (Michael R. Smith/The Prince George's Sentinel). 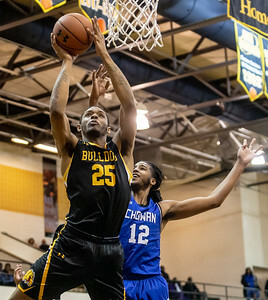 Bowie, MD, Saturday, February 16, 2019: Yohance Fleming (25) of Bowie State puts up a shot during a CIAA basketball game between Chowan University and Bowie State University held at A.C. Jordan Arena in Bowie, MD. (Michael R. Smith/The Prince George's Sentinel). 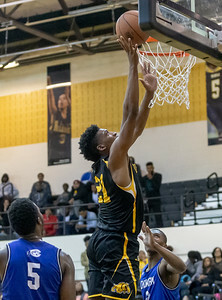 Bowie, MD, Saturday, February 16, 2019: Saiquan Jamison (21) grabs one of his 13 rebounds during a CIAA basketball game between Chowan University and Bowie State University held at A.C. Jordan Arena in Bowie, MD. (Michael R. Smith/The Prince George's Sentinel). 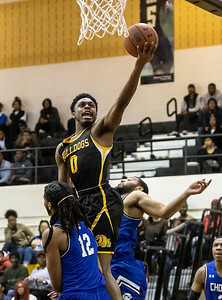 Bowie, MD, Saturday, February 16, 2019: Rinardo Perry (0) of Bowie State soars to the basket in a 68-66 win over Chowan in a CIAA basketball game at A.C. Jordan Arena in Bowie, MD. (Michael R. Smith/The Prince George's Sentinel).